i'm adding this update at 4:00 PM sitting next to Nash spill. I promised to meet all of our delivery demand today, but I missed the goal by a few head gates. It looks like it will be another several hours until we get water to them. Early this morning the water reached the end of the Highline and all but two laterals are filling - S and U1. Both of these have a lot of tumbleweeds that we need to remove but I expect we'll be filling both of those by this afternoon. As I'm sure most of you know, the gopher and vole populations seem to have exploded. Fortunately, we haven't been seeing a greater than normal number of leaks due to gopher holes this season. As of this morning we've had less than a dozen, and all but four we're fixed with a shovel, those four required a machine. The key to keeping a small gopher hole leak from turning into a 10' wide breach in the bank is to get to them early. We appreciate you all keeping your eye out for wet spots on the banks, wet spots in your fields, etc. I expect we'll be delivering to all but a few head gates by tomorrow, although some head gates on the longer laterals probably won't get delivery until Friday. We're still pushing hard, so it's a little difficult for us to estimate how long it will take to fill and check up the laterals as we have no experience bringing the water in this fast. So long as your ditch rider knows you need water he will let you know as soon as it's available at your head gate. I shot this short video this morning when the water got to Rock check at 8 AM. This tool accomplishes in a few minutes what used to take an hour and several men. It's proven itself invaluable, especially bringing the water in so quickly. Most of the blown-in weeds get burned before we bring the water in. But the wind doesn't stop, so no matter how much we burn, we still get a lot of weeds floating. When these floating weeds and branches get to a check structure they can clog the openings. In the past we used manpower and weed hooks, sometimes taking hours to clear these weed-jams. For the past three years, we've been using our Aquatic Vegetation Rake (AVR) that we purchased to remove Flowering Rush and cattails to take care of the weed-jams. 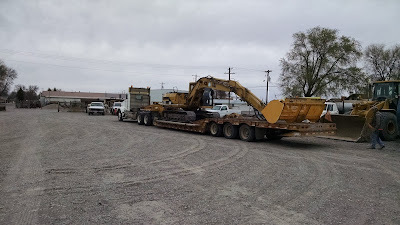 Here's a picture of our 10' AVR on out CAT 312 about to be staged at Pratt check overnight. We expect the water to get to Pratt check on the Highline sometime late tonight (or very early in the morning). I just took this photo looking downstream (roughly West) at the head of D Lateral (downstream of Springfield-Taber Rd.). We're pushing the water as fast as we can safely accomplish.Our usual start-up time would have the water here at the head of D lateral between 72 and 80 hours after turning it in from the river. It's here in 50 hours, so we're right on schedule for delivery by April 10th. We should be putting water down the Highline and Lowline tonight. This morning we are diverting 500 cfs. 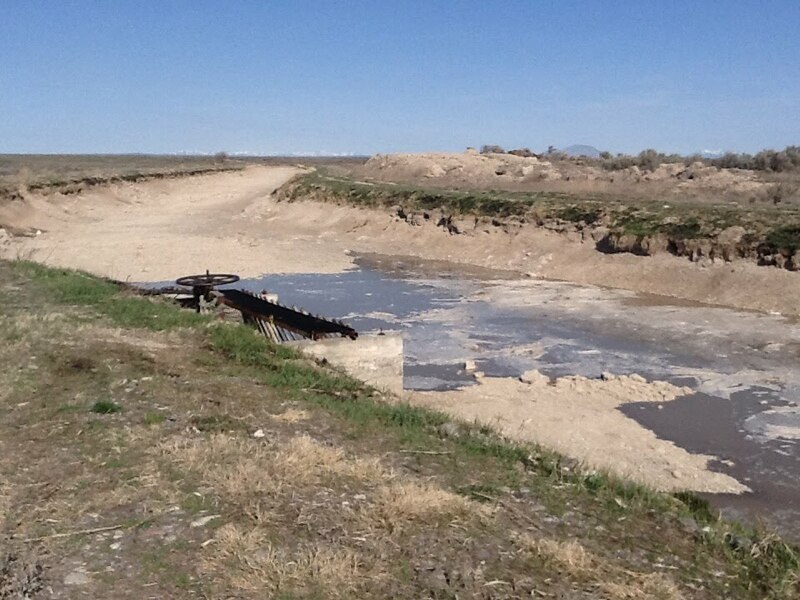 By Sunday we'll be up to 700 cfs and we'll start checking up the Main Canal. I know it seems unfair, but I'll have to start delivering to lands on the upper end of the system first. At the speed we have the water moving if I waited until the water got to,the end of the system before I started delivering upstream we would have way too much water already on its way to the end. So please bear with us, we understand the urgency and we're working around the clock to get you water as soon as we possibly can. The official water turn-in date has been scheduled for this Wednesday, April1 st. We plan to have full delivery to all shareholders on the system between April 10th through the15th; depending upon your location. It is suggested you call your Ditch Riders for updates as to the whereabouts of the water and when you may begin ordering your water delivery for that location with an ON & Off schedule. A "target date" for the water turn-in of the 2015 Season has been set approximately for April 4th with April 15th most likely date that water will be deliverable on the entire system. This of course is dependent on mother nature and whether precipitation is received between now and then. Keep posted for updates. The Idaho Water Resource Board (IWRB) recharge water right came in priority on February 18 and the Bureau gave official notice of temporary suspension of enforcement of the Winter Water Savings portion of the Palisades contract after close of business on February 20. Therefore, our recharge effort,s to the Hilton Spill, for the 10 days we ran, totaled 3,341 acre feet. I've just finished the storage allocation for this year and we'll be sending out your storage balance reports by the end of this week. What's more, as of the date of this post we are still drawing natural flow (last year natural flow went away in mid-June), although we could see that disappear any day, especially with the hot weather we're having. I'm happy to report that we received water from the Rental Pool. I included the additional water on your water account balance letter we sent out last week. So far we're doing a pretty good job getting the rotations set, and I would like to thank all of our water users for being so cooperative with my ditch riders. If we can stay on track, we have a good chance to make it to late September.